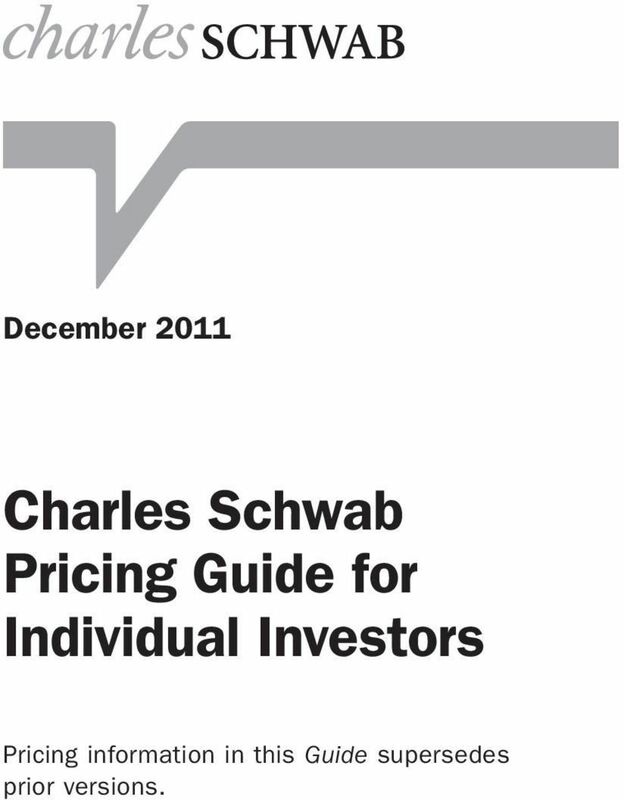 Download "December 2011 Charles Schwab Pricing Guide for Individual Investors"
1 December 2011 Charles Schwab Pricing Guide for Individual Investors Pricing information in this Guide supersedes prior versions. 2 Contents Introduction...1 Definitions...1 Minimum Deposit Requirements...3 Commissions and Transaction Fees...4 Account Activity Fees...7 Special Service Fees...9 Endnotes...10 How to Reach Us: By Phone: Schwab by Phone : To reach an Investment Professional or to use our automated phone services, call TeleBroker : For access to our automated touch-tone services, call SCHWAB ( ). For services in : For services in español: International clients: For services in English, español, call or By Web and Wireless: chinese.schwab.com Web-enabled phone: Look for Schwab on your phone s web menu. PDA: Consult on your desktop. Schwab reserves the right to change or waive fees at our discretion, subject to notification in accordance with applicable laws and regulations. 8 Option Commissions per Executed Trade Online $8.95, plus $0.75 per contract Automated Phone Online commission plus $5 Broker-Assisted Online commission plus $25 Note: Stock or option trades resulting from an option exercise or assignment will be subject to the corresponding online commission pricing schedule. Fixed Income Investments Schwab reserves the right to act as principal on any fixed income transaction, public offering or securities transaction. When Schwab acts as agent, a commission will be charged on the transaction. When Schwab acts as principal, the markup is included in the bond price. New Issues, including Certificates of Deposit Treasury Bills, Notes, Bonds and TIPS (Secondary and Auction) Secondary transactions for Corporate Bonds, Municipal Bonds, Government Agencies, Zero- Coupon Treasuries (including STRIPS), Mortgage-Backed Securities and Certificates of Deposit Unit Investment Trusts Preferreds or REITs Commercial Paper and Foreign Bonds Online Commission or Markup 6 Broker- Assisted Commission or Markup $0 (a selling concession may be included in the offering price) $0 $25 $1 per bond ($10 minimum/ $250 maximum) Not applicable Online pricing plus $25 per trade Sales charge applies. Please see prospectus. Stock commissions and minimums apply for secondary transactions. These are specialty products please call us for information. 14 This page is intentionally blank. 15 This page is intentionally blank.